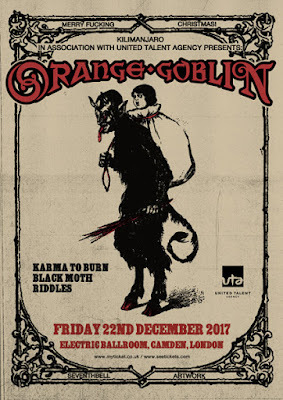 Orange Goblin Announce Details For Their Annual Christmas Show! ORANGE GOBLIN ANNOUNCE DETAILS OF THEIR ANNUAL CHRISTMAS SHOW! It doesn’t matter if you’ve been naughty or nice this year, Orange Goblin invite you to their annual evening of stoner metal merriment at the Electric Ballroom in Camden Town, North London on Friday, December 22nd. As is tradition, they’ll be bringing along some Evil Elves to help spread the festive cheer, and 2017’s Special Guests are none other than Karma To Burn, Black Moth & Riddles. “It’s that time of year again, when we get to unleash a little bit of Heavy Metal festive cheer,” proclaims Orange Goblin front-man Ben Ward. “We are very excited to announce this year’s show, back at the trusted Electric Ballroom in Camden on Friday, December 22nd, and we have an amazing array of support bands to make this a very special Christmas show. “First up, there’s London’s own retro firecrackers, Riddles, who are sure to get things moving with their groove-laden mix of Sabbath and Hawkwind. Next up, there’s the awesome Black Moth, who are always devastating live and have just recorded what will surely be one of the albums of 2018. Then, as main support, we have a real treat for everyone with a very rare UK appearance from our old friends from West Virginia, the legendary Karma To Burn. Not forgetting ourselves, of course! Having survived the summer festivals, Orange Goblin round off the year with a handful of headline shows in Ireland, plus festival appearances in Greece, Switzerland, The Netherlands and the UK. November will see them return to the US for an exclusive one-off performance opening the main-stage at the biggest heavy metal festival in America: Ozzfest Meets Knotfest. Tickets for the Orange Goblin Electric Ballroom event go on sale on Friday, September 29th at 10am.